Currently there's one apprentice in the commercial area, five apprentices are assigned to computer science. 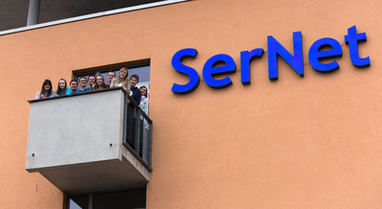 Therefore six young people in training – four women and two men - are employed at SerNet. Instructors are Reinhild Jung for the commercial and Oliver Seufer for the technical area. Every three years, the positions for business apprentice and development apprentice are open for application (next openings: 2017). Every single year we are looking for recruits in computer science - system integration. Next opening: August 2015. It is higly recommended that applications for the positions, starting each August, are submitted well in advance! That said: The position is already filled for August 2015. Your next chance is to apply for 2016. In collaboration with the Berufsakademie Göttingen you can complete a combined vocational training and degree program (Bachelor of Business Administration) at SerNet. The final statements are obtained in a bachelor's and an IHK exam. Our first graduate at SerNet was able to complete his studies successfully in 2011. Thereafter he obtained his master's degree at a university in London in 2013 – while also working at SerNet. Meanwhile two other students work at SerNet and started their undergraduate studies. If you are interested in the dual degree program please contact via phone or e-mail Reinhild Jung. The next term starts in July 2017. Please send in your applications ten month in advance! SerNet wants to increase the number of female employees in IT. Applications from women will therefore be reviewed with special interest. The German General Equal Treatment Act will be adhered to. Interested? Please send an e-mail to Jobs@remove-this.SerNet.DE.